Have you ever had an idea in your head that ended up turning out WAY cuter than you had anticipated? 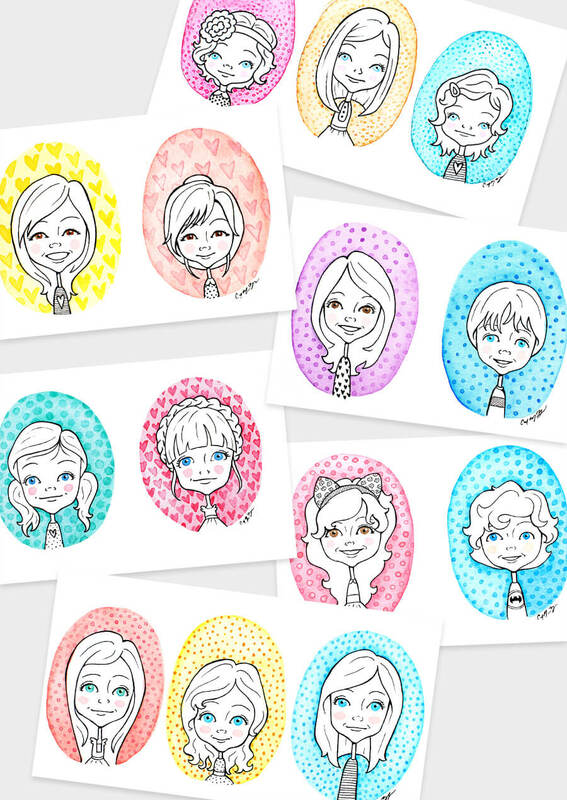 I didn’t think I’d have so much fun with these silly Doodle Portrait illustrations. And I certainly never imagined they’d be so well received. I’ve painted 23 so far and I have 24 more to do that I’ll be finishing up in the next week. (And 5 more that we’re putting on hold until next month, in a bigger size!) This round of paintings should wrap up everything from my sale last month. I’ve been struggling with some pretty lame feelings lately, mostly involving not being good enough. Feelings that I know are stupid, but I just can’t seem to shake. I’m so very grateful for every single painting that I am asked to do, because painting is extremely therapeutic for me. It’s a way for me to share a tiny bit of my soul with people all over the world. (I just sent artwork to the UK and Australia!) I’m hoping I can push out these negative feelings and turn my week around. I’m going to share a fun little project later this week as a part of the Hunger Games series over at Rae Gun Ramblings. I’ll be sharing my post on Wednesday, and adding a little something to Marissa’s big giveaway, so you should go enter. This post got a bit rambly…. I’m blaming the lack of sleep and Mondayness. I need a nap. November 10, 2014 in Watercolor. I would love to get some doodles done of my girls. Can you tell me how I can get your info and how much? Thank you.